Happy Monday My lovely friends! I have NEVER had butternut squash till this Fall season. Can you believe that? My god, I have been missing out. It is now my favorite vegetable to eat, hands down! I mean, I would see it in the grocery store and think that doesn’t look like the average squash I am used to eating and then wouldn’t bother. This year, I wanted to try new things and I am very happy that I did. You know a vegetable tastes amazing when all you have to do is drizzle olive oil, salt, and pepper and it would taste fantastic. 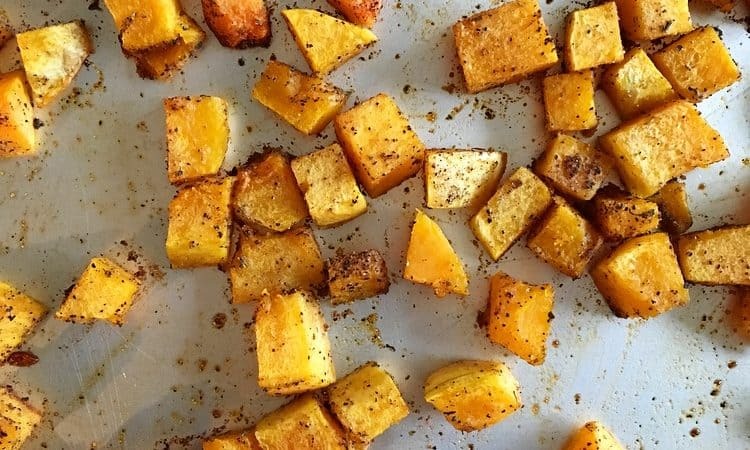 This roasted butternut squash is super easy and super flavorful. Preheat the oven to 400 degrees. Take your butternut squash and place in a microwave for 2-3 minutes. This helps to peel and cut it. Then peel your squash and cut the squash in half; scoop out the seeds and then dice up the squash into bite size. Spray the baking pan with olive oil and place the diced squash in the pan. Add all your seasonings and olive oil and mix together in the pan until all squash is evenly coated. Then place in the oven for about 25 minutes till tender and light brown. I was snacking on these as soon as they came out of the oven; you will be doing the same! These make the perfect vegan side dish. It is healthy, easy to do but bold in flavors and vegetables accompany any main entree very well.